Larger home appliances, such as electric ranges, dryers and some air conditioners, use a 240-volt supply rather than the usual 120 volts. 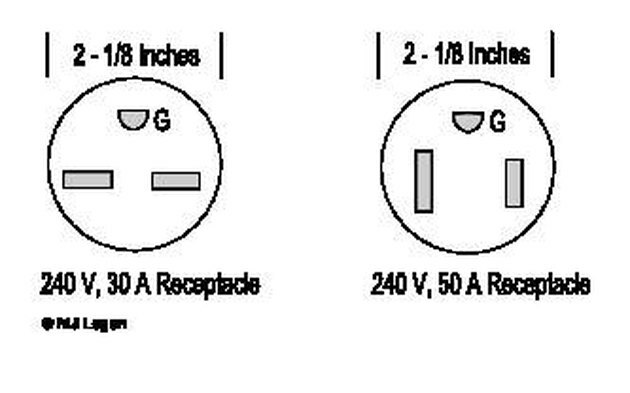 Installing an outlet for these appliances is no more difficult than than installing a standard 120-volt wall outlet. The main difference is that different appliances use various types of outlets. 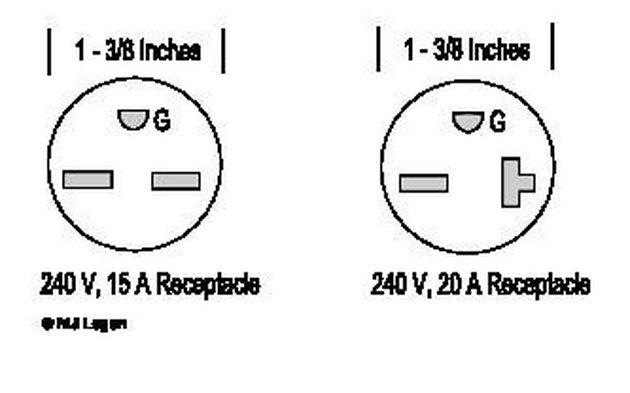 Grounded receptacle rated at 250 volt and 30 amp. Determine the amperage and voltage requirements of the appliance being installed. The product should ship with a label attached that specifies voltage and current requirements. Product documentation should contain the same information. Purchase a 240-volt outlet, circuit breaker and sheathed cable to meet the power requirements of the appliance at your local hardware store or home center. Install the 240-volt circuit breaker in the circuit panel. Turn the main circuit breaker off. Remove the panel cover and locate two adjacent open positions. Snap the new double breaker into place. Pull the new sheathed cable into the circuit panel, remove the sheathing and strip 3/4 inches of insulation from the wires. Make the connections to the ground and neutral bus bars before connecting the two hot wires to the new breaker. Reinstall the panel cover. Make sure the new double breaker is turned off before turning on the main breaker. Run the sheathed cable to the appliance location and install the new receptacle box there. Strip the cable sheathing away from the cable and run it into the outlet box using the appropriate bushing or connector. Strip 1/2 inch of insulation away from each conductor that will be used. 240-volt outlets for 15 and 20 amp appliances. Make the ground connection. Insert the ground wire into the ground lug on the receptacle and firmly tighten the screw. In the illustrations, the ground lug is labeled "G". 240 volt outlets for 30 and 50 amp appliances. Make the neutral connection next if there is one. Not all outlets have a neutral lug. 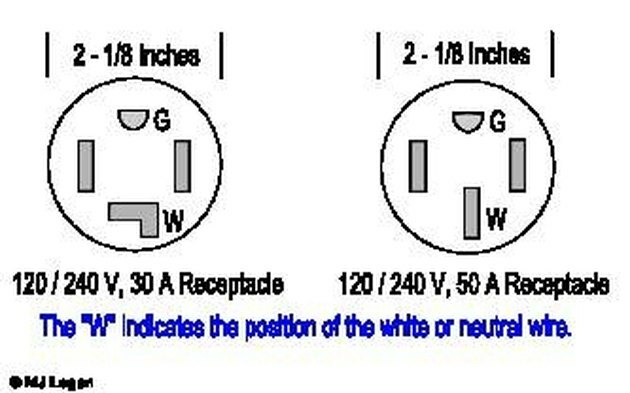 Outlets with three lugs do not have a neutral (see Tips). 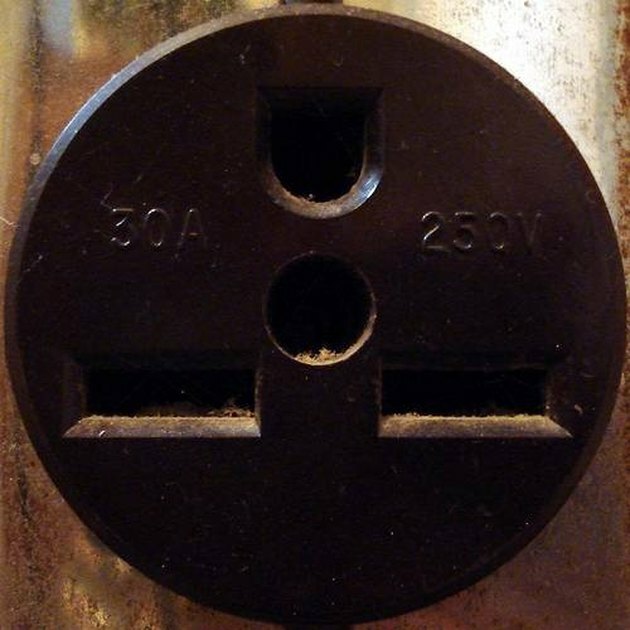 In the illustration, these lugs are labeled "W". 120/240 volt, 30 and 50 amp outlets for dryers and electric ranges. Make the two hot connections. Insert the colored wires into the hot lugs and firmly tighten the screws. These lugs are commonly labeled with L1 and L2. It does not matter which hot wire is connected to which lug as long as both are hot and not neutral or ground. Push the wires into the outlet box and screw the outlet to the box. Install the outlet cover and turn on the power to the outlet for testing. 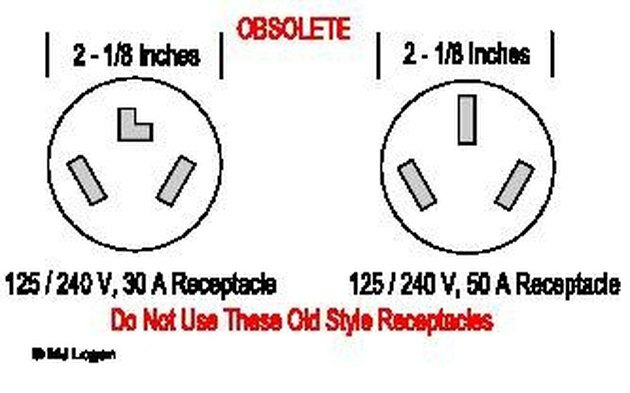 Old, obsolete outlet styles for reference only. Test the outlet using the neon voltage tester. The voltage between the two hot poles should be 240 volts. The voltage between one hot pole and the neutral pole (if there is one) should be 120 volts. Repeat the hot-neutral test between for the other hot pole. Finally, test the voltage between the ground pole and one hot pole. This should also be 120 volts.